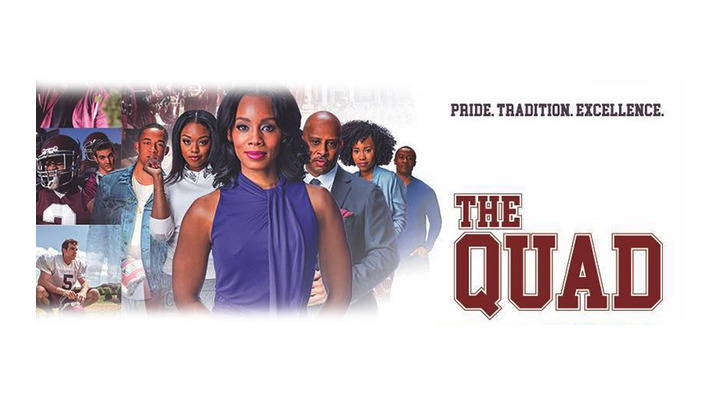 New York, NY – November 28, 2017 – BET Networks announces Season 2 of hit series “The Quad” starring Tony Award winners Anika Noni Rose and Ruben Santiago-Hudson. Premiering Tuesday, January 23, 2018 at 10 P.M. ET/PT on BET, the new season also sees the return of stars Peyton Alex Smith, Jazz Raycole, Zoe Renee, Jake Allyn, Michelle DeFraites and Sean Blakemore. It’s Spring semester and Georgia A&M’s survival as an independent, historically Black university hangs in a precarious balance as the driven Dr. Eva Fletcher (Rose) struggles to raise capital for the nearly bankrupt institution. If she fails, the school may be forced to join Georgia’s large, public and predominantly White university system in order to keep its doors open. Students protest, allegiances are challenged and friendships are jeopardized as students, faculty and the administration struggle to define their place in the fight while our freshman class also deals with the stress of pledging, hazing, academic probation, post-traumatic stress, hate crime attacks and prescription drug abuse. An all-star lineup including Antwan “Big Boi” Patton Sr., Sheryl Lee Ralph, Debbi Morgan and RonReaco Lee join Jasmine Guy in recurring roles. Felicia D. Henderson returns as Showrunner and Executive Producer along with Executive Producer Rob Hardy. Kevin Arkadie and Mitzi Miller serves as Co-Executive Producers. For more information about “THE QUAD,” please visit BET.com; and join the conversation on social media using the hashtag #TheQuadBET.